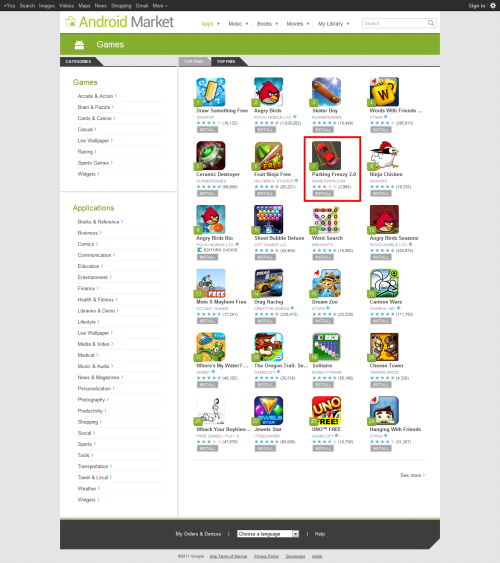 Games2win shared that its Android Game ‘Parking Frenzy‘ has scaled to the No 7th position on ‘Free Games’ section in the Android Market (USA), making it probably the first game from India to have featured this high in the space. Traditionally, the top slots are occupied by games such as Angry Birds and Fruit Ninja. The Parking Frenzy game has been downloaded 2.3 million times (as per Google Android statistics) and played over 8.5 million time in a span of just 10 days since it was launched. GameSpot, the world’s largest games review site also reviewed the game! Games2win shared its flurry.com analytics (Flurry is a leading mobile analytics company) that revealed that the game has 2.2 minutes of median time spent, 20.7% returning users and 350k Daily Active Users (DAUs). To experience the game, download from here!